The Old City of Thebes, Karnak and Luxor are still the hearts of one of the largest mystery schools on earth where ancient wisdom and knowledge of the highest order was practised with the utmost respect. Every moment you spend retracing the footsteps of the Pharaohs, high priest and priestesses of Egypt from Sakkara where the first pyramid was built to Luxor known as the worlds greatest open air museum will have you breathless with awe and a hankering to understand more. 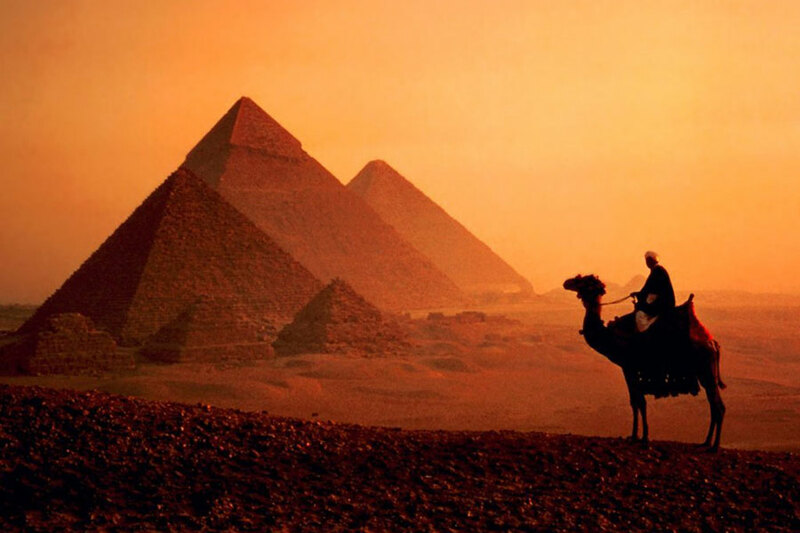 From your very first glimpse of the Pyramids on the Giza Plateau Egypt will cast its magical spell upon you. Feeling like you have stepped back in time Walid our guide gives everyone in the group the name of one of the famous Egyptian gods or goddesses so as when you are at a site you will learn and absorb more easily. It is uncanny how he seems to pick the right character for each individual. We will visit Cairo, its famous bazaar and museum to acquaint ourselves to the Egyptian way of life. Travelling further south we will experience one of the highlights of the trip – cruising the Nile. Seeing the Nile for the first time one can understand the words of Herodotus…”Egypt is the gift of the Nile”. From the lively town of Aswan where the scent, colour, spices, perfumes and music capture your heart to the Valley of the Kings located just out of Luxor on the west bank you will simply wish it would never finish. Every day visiting famous sites such as Edfu, Kom Ombo, Isis temple, Abu Simbel and then back onto the cruise ship where as you sit on the upper deck looking out across the nile it feels like you are back in biblical times is just pure magic. At night time as the sun sets everything changes. The exotic side of Egypt shows itself as you venture out to eat hearing the beat of the nubian drums in the distance and the lively conversation between the local egyptians accepting that you must embrace the night air to indulge in all of its mysteries. There will be time for meditation, sharing of ancient wisdom and healing modalities as we traverse these lands reconnecting with moments in time that our souls will remember. With the “Rose Red City – half as old as time – Petra” just a hop skip and a jump away you will have an opportunity to explore Jordan and all of its magical wonders. An optional add-on is available for a four night/five day journey to visit Amman, Petra, the Waddi Rum Desert and the Dead Sea. Although I had not met Sharon Breslin before I was welcomed as if I was part of the family. The expert guides that Sharon had picked for our tour of Egypt and Jordan were nothing short of amazing. Their friendliness and love of their countries was almost tangible. I felt as if I had just arrived home. (which is pretty amazing since I had only ever dreamed of seeing all the wonders of Egypt). As a small group, we laughed together and were also saddened by the misinformation regarding the dangers of travel to these wonderful countries. We were nothing but safe! I would like to thank Sharon and Lifestyle Journeys for the wake up call to my soul and would recommend this tour to anyone who has ever dreamed the dream. Thank you again Sharon. This trip changed my life. My name is Clive Treadaway and I’ve just returned from my fourth trip with Sharon and Lifestyle Journeys, this time we went to Egypt and Jordan. Once again I returned home changed forever. The quality of the guides Sharon knows are World Class, extremely knowledgeable and genuine with incredible personalities…it’s always an honour to meet these masters. It is impossible to say what the highlight of my journey was…lest it be the people themselves. The local Egyptians and Jordanians were awesome, very welcoming and generous, I straight away felt welcomed and safe and have made lifetime friends that I hope to see again. Sharon can give you an incredible experience, how would you feel chanting in the Kings Chamber inside of the Great Pyramid in a private session with no tourists! Magik moments! Thank you once again Sharon and Lifestyle Journeys from the depth of my heart, Namaste. Egypt was a place that I have wanted to visit for decades and never thought I would find the perfect opportunity to fulfill my dream. Then I met Sharon Breslin nine months ago and it all fell into place for me. Our Egyptologist guide Walid El Batouty was a fountain of knowledge and very passionate about sharing his love of Egypt with us. To stand next to the Sphinx with the Pyramids in the background and to see the Abu Simbel Temple – I was in awe of all that I saw, the hieroglyphic stories intricately carved in stone that told of life in ancient Egypt. Here I was standing under the same Sun that shone on ancient Egypt. I thank Lifestyle Journeys for making this trip possible for me.